As Somerset wedding photographers we are always on the look out for new Somerset wedding venues to visit so we were so excited to visit Woodlands Castle ahead of our wedding here in early 2019. If you are looking for the prettiest Somerset wedding venue, with a beautiful area for an outdoor wedding ceremony, plenty of outdoor space and a pink tinted Castle, then look no further than Woodlands Castle! It’s set deep in the heart of Somerset near Taunton and we can just tell it will provide the perfect setting for any wedding day. We met Woodlands Castle’s wedding coordiantor Kamila and asked her all about this amazing Somerset venue. Tell us a bit about the history of Woodlands Castle. Woodlands Castle is a late 18th century building, which was built in 1810 and was remodelled and enlarged by Richard Carver c1833 for Mrs Lock. The house, originally a farmhouse, is elaborate with its picturesque façade in the, then fashionable, Regency style. The house appears in Kelly’s ‘Directory of the County of Somerset’ of 1861 which describes ‘Woodlands, the seat of the Hon. Charles Napier, as a pretty villa residence, situated in well laid out grounds, and commands a fine view of the Cothelstone hills.’ Charles Napier died in 1874 and is buried in the local churchyard. Other notable residents of the house include Major-General Henry Brasnell Tuson CB RMA, aide-de-camp to Queen Victoria, Commandant-General of the Royal Marines, and in more recent years Dr Fleming. Woodlands Castle is now owned by Sir Benjamin Slade. What areas are available for the ceremony & reception? There are various spaces available for the ceremony – this depends on the guest numbers. With guest numbers of 50 or below the ceremony can be held in the house in Orchard Suite. 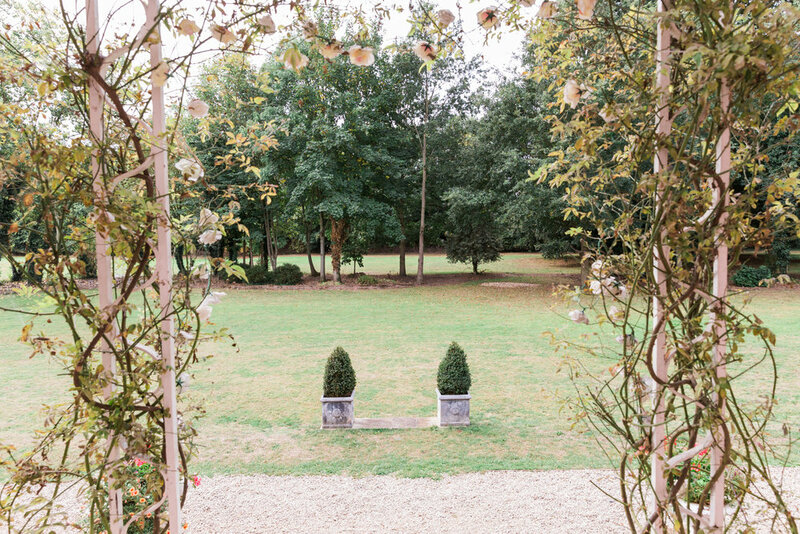 Alternatively, guest numbers over 50 the ceremony can be held on the grounds and under the veranda (weather dependent) or in the Garden Pavilion. The reception following the ceremony is held in the Garden Pavilion. This space caters for the Wedding Breakfast and evening reception. How many guests can you accommodate on the day and evening? Do you hold ceremonies everyday throughout the year? Yes, we can hold ceremonies everyday of the week throughout the year (excluding Christmas Day). How far in advance should couples book your venue? We do have late availability packages however, we suggest up to two years in advance. Yes, we have lots of guest parking. Who from the wedding venue will be present on the wedding day? Are there areas for the couple to get ready in the morning? Yes, the house has rooms available to get ready in. Specifically, we have Stoke which is the bridal room, Blackbrook and Henlade – all of which are upstairs. There is not any accommodation onsite however, there is a Premier Inn which is 5 minutes walk away with 100 rooms. Alternatively, there are various picturesque cottages and B&B’s locally. Lastly, what do you love most about your job? I love meeting new couples and helping them plan their special day. Job satisfaction is immense when you watch all the planning come together, and seeing everyone have such a fantastic day.